After my first trip to Central America (Panama) last year I realized two things. 1: I really wanted to return and travel more in Central America. 2: I should learn Spanish, because traveling is so much more fun if you speak (at least a little bit) of the local language. Hence I started searching the web on where would be a good place to study Spanish. Initially I really wanted to go to Colombia (ok, technically not Central America) and spend some time in Medellin, where I found some Spanish (group) courses. But then a friend mentioned Antigua in Guatemala to me. A place that often came up in my google search results too as one of the best places to learn Spanish in the region. View over Antigua from Cerro de la Cruz. 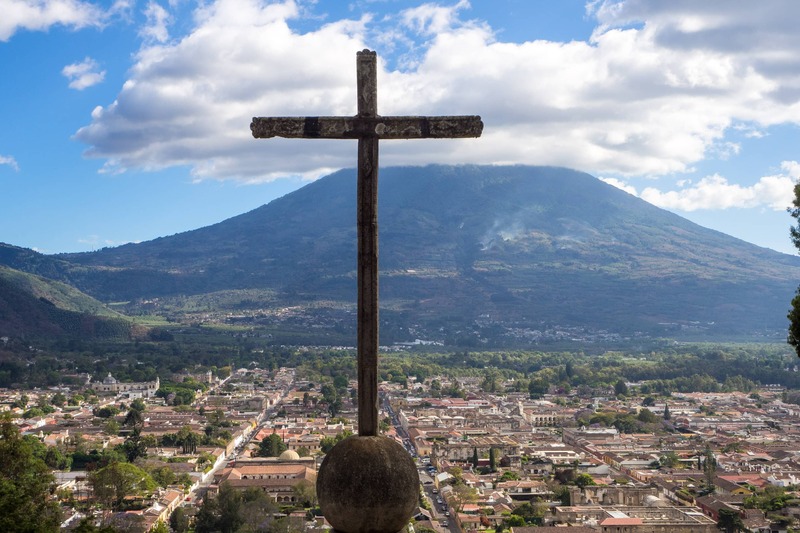 Why learning Spanish in (Antigua,) Guatemala? The two main reasons why I choose for Guatemala to learn Spanish were cheap private lessons and stunning nature. I did not know much about Guatemala, but a little research showed that the country offers among the cheapest language courses in the region. Example: in Antigua I paid about 225USD a week for 5 days of private lessons (4hrs a day) including private room in local homestay and three meals a day. In Quetzaltenango (a.k.a. Xela), another city in Guatemala, the rates go as low as 175USD a week for similar packages. In terms of nature and culture, Guatemala just (almost) seemed to have it all. Stunning active volcanoes, cloud-forests, rainforests, ruins, ancient villages, it just looked amazing. Thus I booked a flight for a period of six weeks. I planned to learn Spanish for a couple of weeks and spend my last two weeks on traveling. Note: in the end I extended the flight, stayed double the amount of time, spent seven weeks in Spanish classes, travelled to Honduras before returning to Guatemala to meet my brother and explore the highlights of the country together with him. Plans always change. 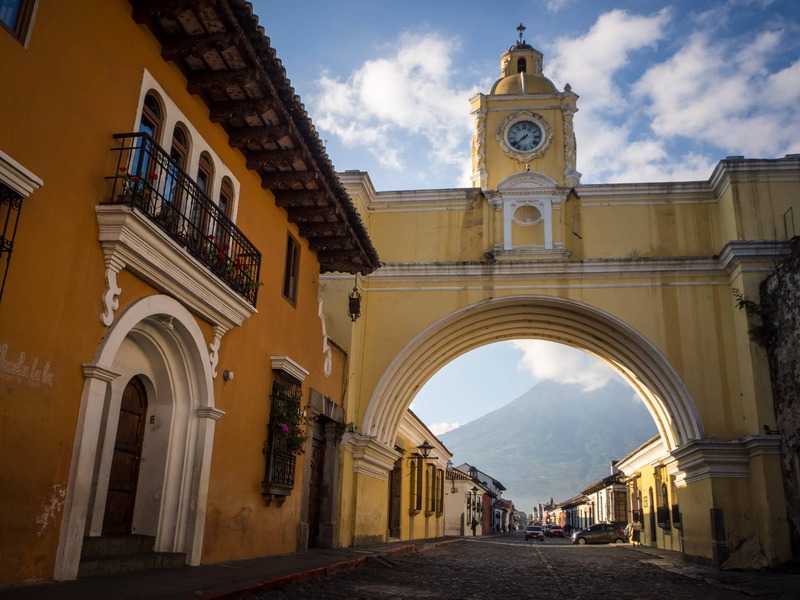 Antigua’s iconic Santa Catalina Arch with Volcán de Agua in the background. After two nights in Guatemala City I made it to Antigua. I checked in at the school and my “mother” Yolanda and “sister” Gabriella picked me up. The home was located right in the center of Antigua, only one block away from the market. I couldn’t have wished for a better location! The home had a small courtyard from where I accessed my room. Furthermore there was a rooftop with beautiful view on the nearby volcanoes. Rooftop sunsets from my home family’s home. The family was absolutely lovely, they really put in a lot of effort to speak Spanish with me. (Well, they only spoke Spanish with me). The first week this was really exhausting for me, since I had only done some lessons on Duolingo prior my arrival to Guatemala. But I believe it was this effort from the family that made me improve very fast. 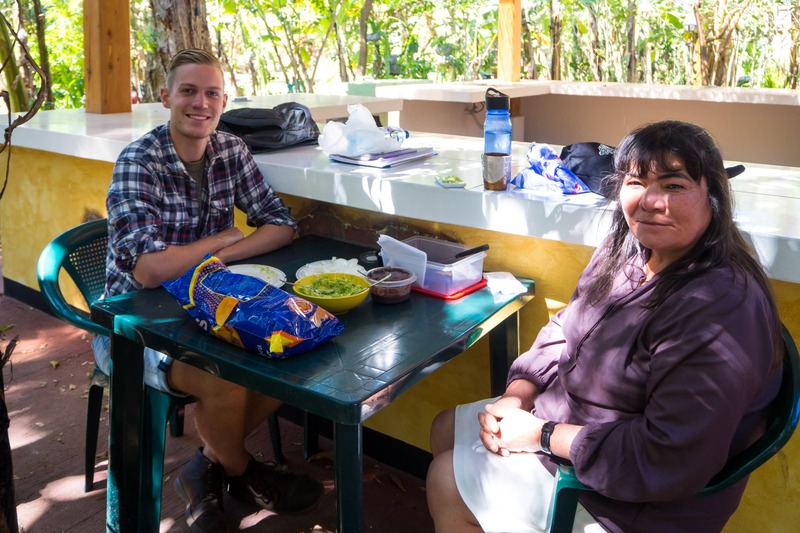 By the time I left Guatemala I felt confident to speak and understand (basic) Spanish. My Guatemalan “father” called Carlos loved to discuss all kinds of actual topics, from Trump winning the elections to volcanoes, problems Guatemala was facing, to all kinds of questions about Holland. Not only did these talks learn me so much Spanish, I also greatly enjoyed them and the genuine interest of the host family. View of the street my home was located in. Then there was the food. Oh, the food! Yolanda could work as a chef in a restaurant. She prepared amazing healthy food every day of the week. Even breakfast was different every day of the week. Once she discovered my love for avocados she tried to include some in every lunch. Dinner is fairly basic (but enough), as in Guatemala lunch is the main meal of the day. 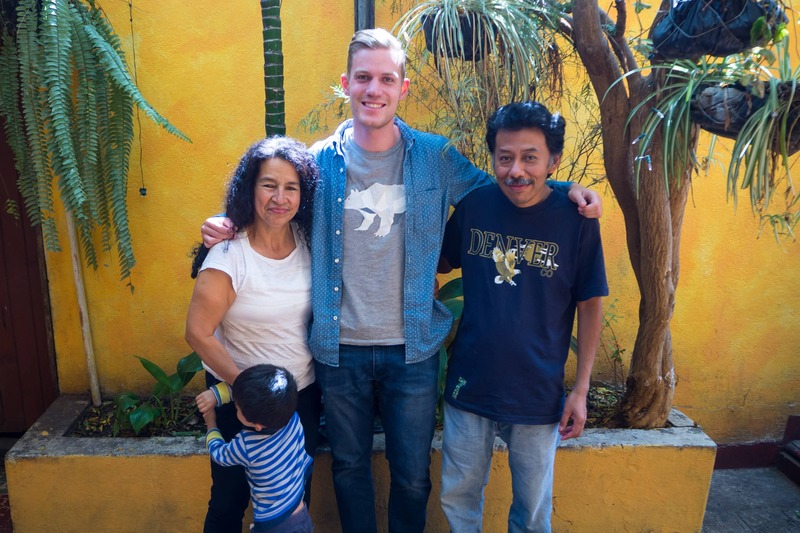 The longer I stayed in Guatemala, the closer I got to the family. Even during my week in Xela, and my travels in Honduras, I maintained contact with Yolanda on Whatsapp. I felt more and more part of the family, which invited me to for various family events as well. Me with my Guatemalan parents and nephew. Beware that host families differ greatly. My family was very warm, welcoming and willing to participate in conversations with me. However the accommodation was fairly basic, and not luxurious (hello suicide shower!) as some of the other homes were. Some families live in upper class houses, and have maids cooking for them. Many of them are more like a bed and breakfast, where the family doesn’t always eat together with the students. This provides more privacy for students, but is not helping nearly as much in the process of learning Spanish. Tip: know what kind of family you are looking for, be clear about that to the school. If you are not happy with the family you are staying at, don’t hesitate to tell the school and ask the management to go look with you at some other families. Don’t feel bothered by this, students switch all the time and in the end it’s about where you feel most comfortable, and where you feel that you are learning the most. Some nights I could see the nearby Fuego volcano erupting from the roof. There are tons of schools to choose from in Antigua, and I spent (too) much time choosing one. The truth is, I think most of them are fine. It all just depends on the teacher you get. From my experience, and from what I’ve heard from other students, the school I studied at (Antigüeña Spanish Academy) has generally very good teachers. Prior arrival I asked the school for a teacher that would (almost) not speak English, in order to force me to Speak Spanish from day one. On day one I met my teacher called Arely, who indeed refused to speak any more English than strictly necessary. I quickly got along well with my teacher. Her focus was mainly on speaking, vocabulary and grammer. The classes were varied and we would usually start with an informal chat, followed by homework correction, grammar, practicing irregular verbs (the verbs are still killing me…), more chats varied with specific (traveling) topics and conversations I asked her to practice. After three weeks I went to Quetzaltenango (Xela) to continue my studies. However, in Xela classes were more focussed on grammar and writing. I really enjoyed my stay in Xela (more about that in another blog), but I just felt I was progressing much faster with my teacher in Antigua. Hence I returned to Antigua after one week in Xela, and spent three more weeks on learning Spanish with Arely. The better my Spanish got, the more we would cover. We would discuss all kinds of topics, such as traveling, family, politics, LGBT in Guatemala, etc. My teacher and I had a little “picnic” during the break my last day in Antigua. I believe it is very important that you feel comfortable with your teacher. If you don’t feel that connection or just don’t like the style of teaching, don’t feel too hesitant to switch teacher either. However I do suggest to at least try to stay with the same teacher for a week, as first impressions are not always the right one. Moreover, be very clear about what your goals are (e.g. traveling Spanish, general, writing, etc. ), as the will develop or adjust the program based on your wished. What did my days look like? I’d wake up at 7AM, have breakfast with my family, made it to school by 8AM and have classes till 12-noon, including a 30 mins break. Most schools in Antigua are located in lovely courtyards (literally almost every building has a courtyard!). Antigüeña has a lovely grass field next to the garden where classes are taught. I would usually chill on the grass during the break time, meet other students while eating a chalupa for 3 Quetzals that could be bought on site. At night, after dinner I would usually be so tired of Speaking Spanish all day, that I would (not) do some homework and just fall asleep early. Though in weekends I usually went out for a couple of drinks in the evening. Speaking of weekends, there are lots of things to explore during the weekends. Beautiful Lake Atitlan is only 2.5 hours away, and so is the beach of Monterrico. I also climbed the Pacaya volcano (one afternoon), and the Acatenango (overnight camping), which offers spectacular views over the active Fuego volcano. Most people go straight from the airport by shuttle (about 80Q) or private transfer (about 250-300Q) to Antigua. You could take an Uber too, which should costs about 150-200Q. Moreover, Antigua is a hub for tourist shuttles. 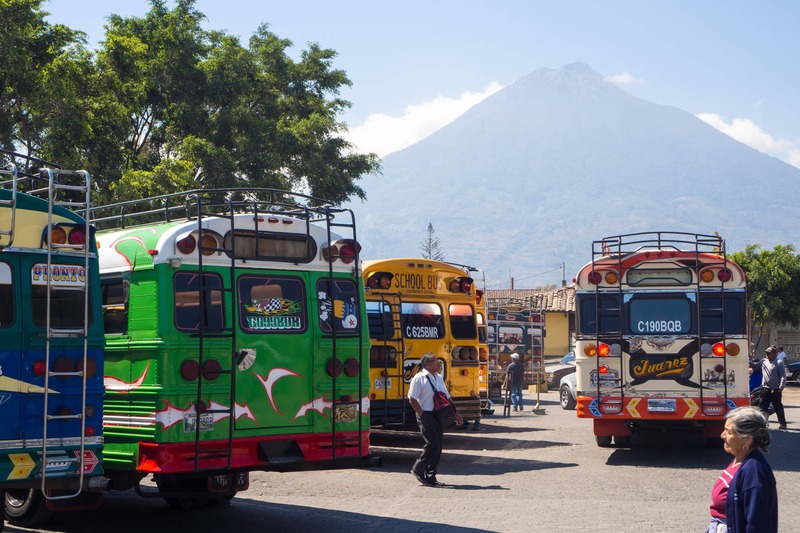 There are direct shuttles from nearly everywhere in Guatemala, or from Copán Ruinas in Honduras. From Guatemala City there are local chicken buses as well for only 10Q. To catch one, go to Trebol station, or just hop on across the overpass in front of the Tikal Futura Mall/Hotel in Zona 7. Chicken buses lined up at the Antigua bus terminal. Internet and WiFi is widely available in Antigua. However, WiFi in family homes is often quite slow. If you want fast internet everywhere you could get a local sim with data. Movistar is the cheapest option with very fast and stable 4G in Antigua, but don’t rely on Movistar for good (or any) coverage outside of the major cities. Choose (slightly more expensive) Claro, or even better: Tigo, for nation wide coverage. I studied Spanish for 7 weeks in Guatemala. I started my classes end of January 2017. Feel free to ask any questions in the comment section below. Thank you, for your inside. It helps me a lot, as I am looking for such a lovely place to study spanish. Hi Michiel. Great blog post! Suicide Showers!! omg! 🙂 I want to hear more about your adventures soon. Was there much to do in Xela? I hear it’s more authentic but the city isn’t that great. And as far as Antigua goes, did you find it too touristy to be fully immersed? I don’t want to speak any English for the duration of my time studying! Hi Niki, I found Xela definitely more authentic than Antigua. It has a more city-ish vibe as well, while Antigua has a more touristy vibe. 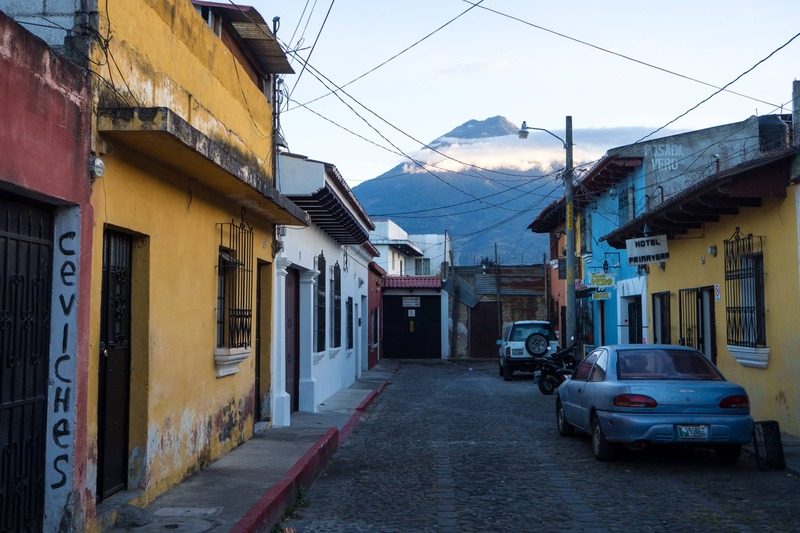 There’s actually a bunch of things to do around Xela, such as really cool natural outdoor hot springs (easy to chat and connect with locals there as well), volcanoes, villages and hikes. It’s also a good place to head on to Huehuetenango, which I unfortunately did not get to visit. That said, I didn’t speak any English with locals there (except with other international students, but the same goes for Xela). Everyone is eager to speak Spanish and I did not experience people switching to English when I tried to speak Spanish. There are tons of opportunities to practise in Antigua as well. In the end I think it really depends on which vibe you like more. You don’t have to pin yourself to one place either, and can actually check out both places to have different experiences. I enjoyed reading this and found it so helpful thank you! How do you feel about safety? I am a young female traveling alone for the first time and I want to be adventurous and not paranoid but I also don’t want to put myself in an unsafe environment. I am also curious about your thoughts on taking a week break in between school. I am thinking i might study for 3 weeks, take a week break to travel to a new spot and study for another 2-3 weeks. Hi there! Yes that makes sense, studying in different places. However I really liked studying for a longer time with the same teacher, as I felt like I was making more progress and the teacher got to know my strengths and weaknesses more, but that’s really personal. On the other hand, it also makes sense to study a bit longer, and travel afterwards for two weeks to use the Spanish you’ve learned. You don’t really need to plan it I suppose, as you can decide every week whether you want to study another week or not. Regarding the safety, I think you shouldn’t have any issues in Antigua. Honestly I felt very safe everywhere in Guatemala, and met plenty of (female) solo travelers. However I’d suggest to stay in the center (or ask for a host family in the center) as these streets are more crowded, also at night. Some parts of Antigua further out of the center can be a bit isolated and quiet at night. Hey Michiel! Have you heard anything about Maximo Nivel? I’m in between Antiguena and Maximo and just curious if you heard anything during your travels about one vs the other. I’m a beginner for sure and I’m planning to travel for 10 weeks to try to become conversational so I’m looking to be fully immersed. This will be my first time travelling alone so, with my limited language skills, I feel like it might be safer to start off with a school that’s slightly more commercial? Insider tips would be much appreciated! Thanks for your help! Hi Claire! Yes, my “sister” in the host family was working at Maximo Nivel. Their location is excellent, but I remember the school is much more expensive than other schools in Antigua. I seems that they invest a lot in marketing and networking to get more students, which might also explain why they are so highly priced. Personally I think the school is good, like nearly all schools in Antigua, but personally I wouldn’t bother paying more just for the “name” of the school. But then again, if you feel more comfortable with any of these schools, just give it a go and remember that you are free to switch anytime when you are in Guatemala. Hola Amigo, realmente disfrute mucho leyendo tu experiencia en mi pueblo, Antigua Guatemala! Thanks for sharing such a good experience! i am still laughing with the “Suicide Shower”.